Chinese New Year is coming, and I am planning to make some stuff for relatives and friends. 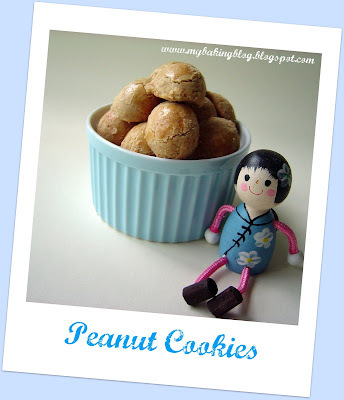 I had some time the other night, and decided to bake some peanut cookies, which turned out to be really easy. I made them into small little mouth-sized oval-shaped balls, which looks more like the "stepped-on tortoises" in Super Mario's game. My colleagues who tested them complimented on the taste and fragrance of the cookies. I sure will be making them again. Hmm These cookies look great. 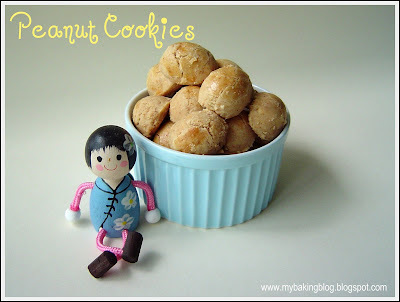 Tks for sharing the recipe. Will try out soon.